The internet search was carried out in December 2012, 18 months after Bobby Ryan went missing and four months before his body was discovered on land then leased by the accused man. The user clicked on links to websites that contained articles called: “The five stages of decomposition” and “How the human body decomposes after death”. 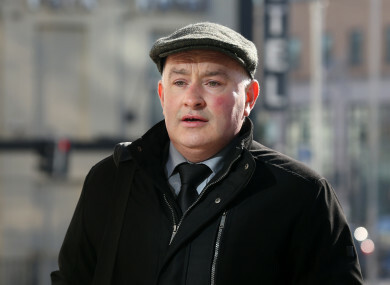 The trial also heard emails were sent from Quirke to Vodafone.ie on 12 and 13 May requesting records of all calls and texts to his phone from 2 to 5 June 2011. Ryan went missing on 3 June 2011 after leaving his girlfriend Mary Lowry’s home at about 6.30am. His body was found in an underground run-off tank on the farm owned by Lowry and leased by the accused at Fawnagown, Tipperary 22 months later in April 2013. The prosecution claims Quirke murdered Ryan so he could rekindle an affair with Lowry (52). Detective Garda Paul Fitzpatrick of the Garda National Cyber Crime Bureau told prosecution counsel Michael Bowman SC that he examined computers, a thumb drive, an iPad, and a hard drive that were seized by gardaí during a search of Quirke’s property in 2013. Using forensic software called Encase he searched the contents of one of the computers labelled KKPQ1 which had no make or model and was registered to a “user” but not to any particular name. He discovered that on 3 December 2012 at about 3.30pm a user searched on Google for “human body decomposition timeline” and later another search was made for “rate of human decomposition”. Following the searches Google returned a number of pages and Garda Fitzpatrick said there was evidence the user clicked on pages contained within websites environmentalgraffiti.com, forensics4fiction.com and suite101.com. Around the same time he said there was evidence of Youtube videos embedded into the webpages viewed but he couldn’t say if these videos had been watched. The second Youtube video also related to the Body Farm and when Detective Garda Fitzpatrick looked at it, it was described as “a study of human decomposition on real corpses” and contained the note, “you will never forget the smell”. The third video had been removed. There was also evidence of an image from a Wikimedia page which contained a reference to “decomposition stages”. Half an hour after this activity the witness recovered an email in which Quirke discussed shares with another man. Detective Garda Fitzpatrick also found older files relating to an operating system that had been on the computer before 25 July 2012. On this he found a record of a website called howstuffworks.com which contained information on DNA evidence and its limitations. The witness also found a backup folder for an Apple computer which contained a cookie file which showed that someone had searched for “Trace Ireland Facebook Bobby Ryan” on 4 July 2012. By June 2014 Detective Garda Fitzpatrick said the bureau had updated its equipment and so he examined the computer again. This time he found references to searches for a slurry tanker on the trading website DoneDeal in December 2012. There was also an email from pquirke@eircom.net to a named person which contained images of a slurry tanker. When he returned to KKPQ1 in May 2015 using a newer version of Encase he discovered a Word document called Mary.doc and an Excel document called Maryowe.xls. He also discovered that on 1 May 2013, the day after Ryan’s body was discovered, a page on the RTÉ website titled “man’s body found on Tipperary farm” was visited. At 8.09am there was a search for “newspaper headlines” and a few minutes later for “body found in Tipperary”. There was also a visit to an Irish Times page titled: “Brother of missing man believes body found is him,” and another search for “body found in Tipperary”. The following day there was a visit to the Herald.ie where there was a story about a “Stalker linked to slurry pit body.” The user also searched for “Bobby Ryan” on the Herald website. There was a further visit to the Examiner website that night and a story relating to Bobby Ryan while on 5 May 2013 there was a search for “Bobby Ryan Tipperary break down”. On May 12, the witness said, Quirke requested from Vodafone an invoice for June 2011. The following day there was a request from Quirke for a log of all incoming calls and texts to his phone from 2 to 5 June 2012. On 15 May 2013, there were various search queries including one on thesun.ie website for “Mary Lowry and Bobby Ryan”. Bernard Condon SC for the defence will cross examine the witness tomorrow in front of Justice Eileen Creedon and a jury of six men and six women. Email “Google search for 'body decomposition' carried out on computer found in Patrick Quirke home, trial hears”. Feedback on “Google search for 'body decomposition' carried out on computer found in Patrick Quirke home, trial hears”.